We are glad to announce a new initiative from the VCCircle family. Yes, we are launching a new media property focused on technology. It's called Techcircle.in, and will help us cover Indian technology business in detail. Our core proposition is high quality content for business audience. We have successfully done that with VCCircle.com, which is a market leading media property for investment professionals, entrepreneurs, and corporate executives. Techcircle.in will do the same for the information-hungry professionals in technology companies, tech startups, investors, entrepreneurs, geeks, students and those interested in how the technology world is shaping the globe and its impact on India. It will cover the major trends, news and views under four main heads â€“ Biz tech, Consumer tech, Internet & Mobile. We will have a bias towards startups since that is where cutting edge ideas are tested and where innovation is brewing. The site will cover internet businesses (both startups and large companies), mobile (value added services, operators, applications), new gadgets coming to the market, enterprise software, SaaS, Cloud computing, Green IT, and other software products and services. 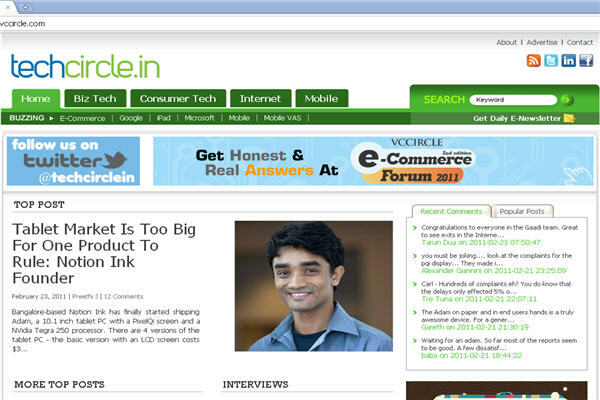 For starters, we have an interview with Rohan Shravan, the founder of Notion Ink, the company which is making news in the international tech world for its tablet PC Adam. Will Adam take on iPad some day or will it survive in the soon-to-be -crowded tablet market? Only time will tell, but check out Preethi J's interview to know what Shravan is thinking. In another article, we take a detailed look at Google leadership change and what it means. It's one of the best articles I have read on Google, and it's written by our San Francisco based writer Sudarshana Banerjee. She is going to focus a lot on global tech and its impact. Another unmissable item is a 20-minute video on Flipkart.com put together by our Assistant Editor Shrija Agrawal. It takes you to the Flipkart office in Bangalore, and interviews with founders, and why Flipkart has got it right. It's a must view. We have several other articles - the Apple CEO Succession plan, Indian regional language texting startup Luna Ergonomics, and magazine and books digitisation startup EC Media International. We will be bringing the latest and relevant tech news and views to you as and when it happens. Kindly send us the feedback and suggestions on how we can improve on editorial@techcircle.in.